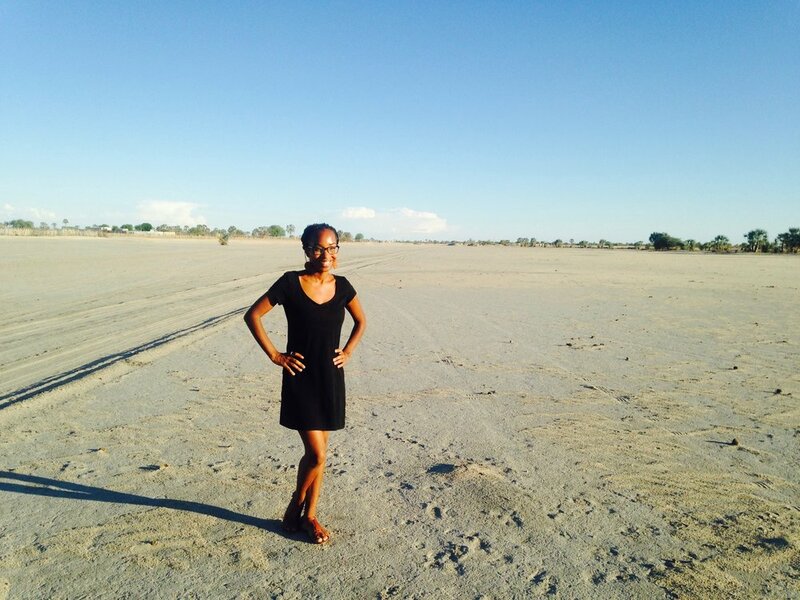 The author standing in a Namibian oshana. I HAVE always affectionately referred to myself as "a child of the sun". That is until I moved to Namibia. Now I literally run away from the sun. Each morning I savor the hours of up until about 9:30am. That's when a sense of dread creeps up in the form of beads of sweat as the day's oppressive heat ushers herself in. I have grown an affection for cloudy days and the rain is always a welcome relief. Ironically, that is the kind of weather I hated back home in the States. Any seasonal affective disorder I once had has reversed itself. Times have certainly changed. The sun on the African continent can be absolutely brutal, particularly to those of us who were not raised under its relentless rays. Here’s how I've managed to survive Namibia's most feverish days. If you don’t like drinking water, it’s time to get used to it. Living in a hot African country, your body will DEMAND it. I consistently find myself a lot more thirsty than normal. To keep up with the increased amount of sweating, I have to drink way more water than whatever I normally drank in the U.S. Living this close to the equator means you will definitely have to increase your water intake. Shade in Africa can be a true lifesaver. It’s truly amazing how much cooler it can feel sitting under a tree. While just a few steps away it's like a furnace. I'm talking a difference of 10 Fahrenheit degrees! If there's a day you anticipate being outdoors a lot, stay under the shade as much as possible and conserve your energy. Sun hats and umbrellas are also absolute essentials that can provide much relief during an afternoon walk in Africa. I generally don't leave the house without my umbrella during Namibia's summer season. Shielding yourself will make walks under the African sun so much more bearable. When I first moved to Namibia I actually thought I could run out for errands anytime of the day. Wrong. I ended up walking to the supermarket with the 100-degree sun beaming down onto my shoulders. When I returned home I would pass out in front of the fan from near heat exhaustion. I realized that, depending on the time of year, the hours from about 9:30 to 5 were completely out of the question for walking anywhere unless it was absolutely essential. If you can, try to schedule any outdoor walking-related activities during the most comfortable times of the day. This is a photo of two cows grazing in a field under the sun. It’s always great to immerse yourself into your newfound continental culture. However, there are simply some things you won’t be able to do like the locals. For instance, my Namibian in-laws will plant, pick and hoe crops into the soil well into the heat of the day and barely break a sweat! I once tried to do the same and started to feel lightheaded in less than ten minutes. Respect your own personal physical limits. Don’t overdo it just because you see locals effortlessly tackling the day's work. There’s a good chance their heat endurance is a lot stronger than yours simply because of their geographical upbringing. Yes, sunscreen is a must. And you can find it sold in many supermarkets, convenience and drug stores across the continent. However, be warned. Just because you don’t see the locals wearing any doesn’t mean your melanin doesn’t need some protection. If you didn't grow up in an extremely hot environment your skin won't be as used to the rays. So slather on some creme before you head out! The hot weather this side of the world can seriously throw your body for a loop. So, you may need to start bathing more than once or twice a day. Or that favorite deodorant you brought with you from America may not be as effective on the continent. You also shouldn't be surprised if, for the first time in your life, you find your melanicious skin peeling from sunburn. The African sun is no joke! The author donning Warby Parker sunglasses with her son. I don't know what it is but everything outdoors here in Namibia appears so much clearer and brighter than they do back home in the States! In certain areas it could be all of the open space. Pale swathes of sand here in Namibia also make for some serious glare. And perhaps the less polluted atmosphere makes the sun rays reflect stronger? A Namibian optometrist once suggested I buy glasses that transitioned into sunglasses outdoors. She told me she was seeing more and more Namibians' eyes becoming damaged over the years from sun exposure. While I hardly ever wore shades back home, I wear them religiously here. They can make your walk, drive or outing a lot more comfortable and with a lot less squinting. Bonus tip: sunglasses are lifesavers if you wear contact lenses. They will protect your contact from dust particles getting stuck on them. Ouch! I'd love to hear your stories of surviving life in a sweltering environment abroad. Share your tips in the comments below! STAY COOL AND CONNECTED WITH OUR MOVING TO AFRICA TECH TIPS!